(APN) MCALLEN, Texas — The Grannies Respond Caravan, a group of grandmothers who are mad about the Trump Administration taking immigrant children away from their parents, converged in the border town of McAllen Texas, for a protest. 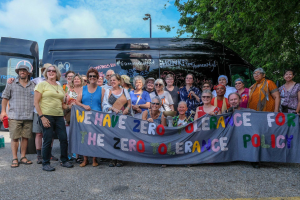 Grannies Respond started out as twelve people, mostly self-described “Grannies,” in a van going from New York to Texas; and it turned into a small army of grandmothers from across the country. Several caravans converged on Texas. Hundreds of grandmothers, grandfathers, angry citizens, and a few dogs traveled in solidarity with the Grannies Respond Caravan to learn first hand what is going on at the border. President Donald Trump’s Zero Tolerance (ZT) policy has resulted in the government-sanctioned kidnapping of some 2,500 small children from their parents and placing them in cages. Many of the 463 parents who were deported by the U.S. face the strong risk of being murdered by the drug cartels they were running from. As of August 08, 2018, 572 children were still separated and may never be reunited with their families. “When I first saw the picture of the kids in the cage, it broke my heart,” Sharon Kutz-Mellen one of the Caravan participants from Kentucky, told Atlanta Progressive News. This sadistic, draconian family separation strategy was conceived by Steven Miller, Senior Advisor to President Trump, as a deterrent to discourage refugees from Honduras, Guatemala, and El Salvador from seeking asylum in the U.S.
Seeking asylum is legal, but refugees are being criminally prosecuted for doing so between the Mexican and U.S. ports of entry, and are often prevented from entering the U.S. at official ports of entry. Trump’s policy has not stopped those fleeing for their lives, but it has created a humanitarian crisis included forced family separation, human rights abuses of children, the criminalization of the act of seeking asylum, and the practice of moving babies and children under the cover of darkness to secret facilities across the U.S. with no plans for reunification. “This is a statement about morality. Are we the type of people who put children in cages and who hire rapists to take care of children in the government’s custody?” Beth Yeager, another grannie from Kentucky, asked. At Southwest Key detention facility for immigrant children in Arizona, a 32 year-old man who worked at the facility was arrested for sexually abusing a fourteen year-old girl in his care, according to Newsweek magazine. At the same facility, immigrant rights advocates report a six year-old girl was repeatedly sexually abused. “I have eleven grandchildren and I can’t imagine for a single moment that one of them would be snatched away from my daughter, my son, or myself. I want to be on the side of those that help, not those that watch,” Rafiah Jones, a Caravan member from Washington, D.C., told APN. 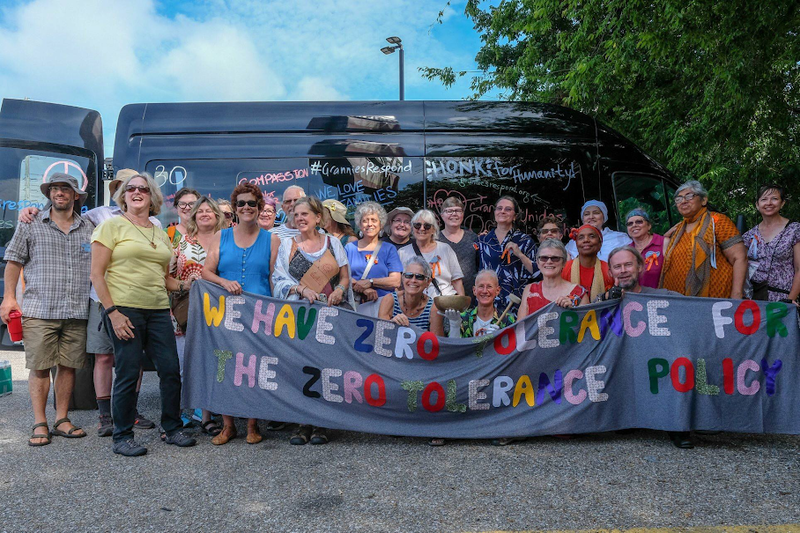 About twenty Atlanta Grandmothers for Peace (GFP) members traveled to Montgomery, Alabama to greet the Caravan that originated in New York, and to donate eight hundred dollars to help them with their travel expenses. Joan DeWitt, Steering Committee Member with Georgia Detention Watch and a member of GFP, traveled with this APN reporter to McAllen, Texas to join the Grannies Respond groups. DeWitt has been working with immigrants for years. She visits them in prison, hosts detainees who have been released, and helps them get to their next destination. The different caravans arrived in McAllen, Texas and gathered at Archer Park. Prior to the Trump Administration, asylum-seekers “were allowed to be paroled in, and then they got court dates and did not have to go into a detention facility,” Ann Wright, a retired Army Colonel and a former U.S. diplomat who resigned in opposition to the Iraq War, told APN. “It is crazy to say you can come in, but we will fill up our new prisons with you, which is part of the prison-industrial complex. Big groups are making a ton of money on this detention policy or imprisonment policy,” Wright said. Incarceration is big business and private for-profit private prisons are America’s Gulag with huge profits for the company, financial rip off for taxpayers, forced labor for inmates, poor quality food, inadequate to no medical care, and abuse of inmates. Private prisons’ business model depends on high rates of incarceration and keeping conditions subpar. They spend billions lobbying Congress, mostly to Republicans and conservative groups, to influence laws to criminalize more people which helps their financial bottom line, according to Open Secrets. Three prisons that operate Criminal Alien Requirement (CAR) prisons nationwide are CoreCivic (formerly “Corrections Corporation of America”), the GEO Group, and Management & Training Corp (MTC). Combined they reported four billion in revenue in 2012, according to an article by the American Civil Liberties Union of Texas. “Between Trump and all the right-wing, racist bigots that he has as part of his Cabinet and support base… [Trump] is trying to stop the browning of the U.S. to try and make it a White nationalist country. Just look at the results and that is what it is all about,” Col. Wright said. “The America we know and love doesn’t exist anymore. Massive demographic changes have been foisted upon the American people … and they are changes most of us don’t like … this is related to both illegal and legal immigration,” Laura Ingraham, a Fox News personality, said on her television program on August 08, 2018. The Grannies Respond Caravan stopped in Dilley, Texas at the largest family detention center in the U.S., where a two year-old baby died shortly after being released. They wanted to go inside and see the conditions the families are living in. “We pulled up to what looked like a concentration camp with facilities in rows… and we were told we were trespassing on private property and to leave or they would call law enforcement. This is a privately owned concentration camp on U.S. soil and they are profiting,” off of immigrants, Dan Agmar-Blair, one of the organizers and a caravan driver, said. At the Renaissance Inn, Jennifer Harbury, a human rights attorney who has been helping people fleeing violence in Honduras, El Salvador, and Guatemala for over forty years, spoke. Trump likes to say that immigrants seeking asylum need to come in legally to the U.S. over the bridge and ask for asylum, but it is his policy that is turning immigrants away at the international bridges. U.S. Customs turns immigrants away at legal entry ports and tells them there is no room. One thing that is causing this bottleneck, though, is the practice of indefinite or at least unnecessary detainment of asylum-seekers over the last year, according to Neta, a local progressive news service, in McAllen. In past years, “everyone who crossed the bridge were allowed to get out on parole for the long duration of their case proceedings,” Harbury said. “If you have legal relatives here who can sponsor you and you have never committed a crime you are supposed to be let out. It used to be about eighty percent were let out now it is between zero and eight percent that is let out,” Harbury said. This has created a crisis on the legal ports of entry at the international bridges. “There were thirty to fifty people on the bridge and many were small children. One three month-old baby ended up in the hospital. A fifteen year-old girl who had been gang-raped and was seven months pregnant was laying in 105-degree heat on the cement, and some refugees had been there fifteen days,” Harbury tells the Grannies. “The border patrol people said you have to wait here and when it’s your turn, we will call you. So they sit and wait, they had no food or water and were not allowed to go the bathroom,” Harbury said. The bridge crisis is what created the Angry Tias and Abuelas, who became a crisis response team to provide water, food, baby diapers, and other necessities to the people stranded and suffering on the bridge. The U.S. Department of Justice’s recent mandate blocks asylum protections for individuals who are victims of domestic violence and gang violence. Now there is almost no legal path for most people to get into the U.S. and that seems to be the purpose of zero tolerance with zero humanity. The American Civil Liberties Union has sued Attorney General Jeff Sessions for denying asylum to victims of domestic and gang violence. “Most of the people who live in the Rio Grande Valley (RGV) are Brown people, we are Mexican descendants. This used to be Mexico and you moved the border on us. Immigrants come to the USA wanting to work and to make it great. This is the potential in each family that comes,” said Martha Sanchez, of lupenet.org . Another myth is that Trump is stopping violent drug gangs from entering the U.S.
Trump likes to conflate drug cartel members with refugees fleeing the violence of drug cartels. The people crossing the border at the International bridges are families and children from Central America. Trump’s racist zero-tolerance policy is a terrorist attack on these vulnerable children and families and does nothing to stop the drug cartels. The drug cartels have plenty of money to fly in private airplanes and special drug boats to get into the U.S. Drugs are smuggled in cargo trucks, freight trains, and underground tunnels, according to Border Patrol and Immigration and Customs Enforcement. Gang members are not standing in line at the international bridges for days in all kinds of weather to get in. Today’s immigration crisis is blowback from the U.S. illegal Contra Wars in the 1980’s that destabilized Central America. “The U.S. got involved trying to stop progressive change in Central America and flooded the area with weapons that are still being used today to train people in the military that were the death squads and have now become heads of drug cartels,” Medea Benjamin, Code Pink, told APN. The Western Hemispheric Institute for Security & Cooperation (WHINSEC), formerly the School of the Americas “is where many military officers got their training and techniques of torture and brutal control of their populations. This is the thread that runs from our government and our tax dollars to the flood of immigrants,” Medea Benjamin, Code Pink, told APN. “NAFTA destroyed the livelihood of millions of farmers. The globalization of the economy made it hard for small business to survive,” Benjamin said. “Every day, call your Senators and Congressperson and demand the end of children in detention, demand an end to for profit prisons,” Jodi Goodman, an Immigration Attorney in McAllen, said. This is a link that tells the stories of children separated from their parents. I got it from the Grannies Respond and they get it from Families Belong Together website under the materials section. We are reading your post in San Antonio. What many people on both sides of the US Mexico border don’t know is the poverty of Mexican American citizems near the border and in large cities. Mexican Americans have been the oblect of violence, of poorly paying jobs and of immigration laws that legalize people from other countries while neglecting home grown citizens.his helps immigration lawyers while huring Rosa and Pedro.A seveloping people must have control of more than a ballot box; they must have at least incomplete control over the economy . 8-2018 Read the history of the 4 US border states as well as Colorado read about how it was originally Native American tribal land taken by Mexico and the US.